Suddenly sheep and cows are the worst things ever, the work of old Nick himself. I don't do numbers,so won't compare emissions from livestock versus vehicles and planes,but I contend that any carbon or methane produced by grazing stock comes from, and returns to, the environment in terms of replenishment of soil reserves,whereas the burning of fossil fuels liberates long sequestered elements to drive climate change. On this farm we are aiming to enhance the soil's organic fraction by the use of well rotted farmyard manure, and by a form of rotational grazing whereby the cattle graze say a quarter of an acre per day:this area is then rested for around six weeks, allowing time for the grass to grow back,and the fraction trodden in by the cattle to be incorporated in the topsoil. In time, the soil's improved capacity to adsorb sudden heavy rainfall will aid the improvement of water quality in the river system. Even in a dry summer such as this, we had plenty of grass for our cattle, and have been able to graze right through the autumn. Varying grass lengths have made for a rather untidy looking farm,but this is a small trade-off against the benefits to the wider environment. To further improve things, we are thinking about strategically planting trees, both in groups and rows,to provide shelter and shade ,and wildlife corridors linking existing habitats. This was back in July,to cheer us up on a grim November evening, and to show how we hope all our fields will eventually look like. Late in March we planted a further 45 metres of mixed hedging to serve as a windbreak for the nursery, and as a screen for the new cattle shed. In the past,I've used a mix of fifty percent hawthorn, balanced with hornbeam, field maple, hazel ,dogwood and spindle,all subjects that grow well here, although hazel isn't wholly happy with our Weald clay. This time, however, we wanted to provide a source of winter food for the birds, so in addition to the hawthorn, spindle and maple I added guelder rose, common privet and holly. Privet does grow in a hedge elsewhere on the farm, and holly occasionally, so watch this space. I managed to place the holly on the drier areas, so we think it will be happy. As a family we didn't really find it necessary to grub out hedges in the past-the furthest we got in that way was to remove odd bits of scrub dotted about, relics of the post war mania for tree felling that dad inherited when he came here in the 1950s. In any event, I'm sure we have planted much more than we removed, and gapped up straggly ones. Reading and observation have taught me that they are more than just boundaries and means for controlling livestock: in a formerly heavily wooded area, they act as a reserve for woodland plants, insects and animals, and as conduits between habitats. This spring, I noticed fresh oak leaves in the bottom of a hedge that we planted in the early days of our Countryside Stewardship scheme: doubtless other neophytes will be found on close inspection. Since joining Twitter (@OmendenFarm), I've let this blog slip. However, there are plenty of topics that demand more space. Since the last post, we've sown a native wildflower mix on a block of irregularily shaped land and on strips in the fields that went into Arable Reversion under the old Countryside Stewardship Scheme. As is the case with such things, patience is a virtue, but the continued rain is cause for despondency:I'm sure lots of the tiny and expesive seeds will have rotted! Fortunately, in tune with the zero-till ethos of contemporary farming, I didn't muck about with the soil, too much, so the water has been getting away comparatively well. Not growing arable crops anymore, I miss my fix of ploughing and harrowing,but my head tells me that it's best for the soil and the microscopic flora and fauna therein if we don't beat it to a pulp every year. When it comes to reseeding some of our commercial grass and clover fields, I will be keen to try non inversion techniques. Naturally, some of the old hands would say that "it wont work...". We shall see. Come rain or shine, the next job is fitting up a rainwater harvest system on a couple of barns to help cut the water bill for the cattle, and reduce run off. After eleven years of Countryside Stewardship and Higher Level Scheme management our twenty five odd acres of hayfields are gradually becoming hay meadows, though obviously not "ancient". Four of the fields were laid down in the 1980's with a commercial ryegrass and white clover mix, the two larger fields were laid down in 2002 with a ryegrass and clover free Countryside Stewardship mix, under the terms of Arable Reversion. 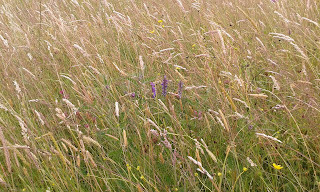 Now, all the areas are fairly mixed with ryegrass-I should think Kent Perennial and Wild White Clover-endemic to this part of Kent. I need to brush up my identification skills regarding the other grass species. I was very excited at this, and amused, as my mother told me that as a young girl after the first world war she helped her father rogue Yellow Rattle from his seed crops of Wild White and Kent Perennial. 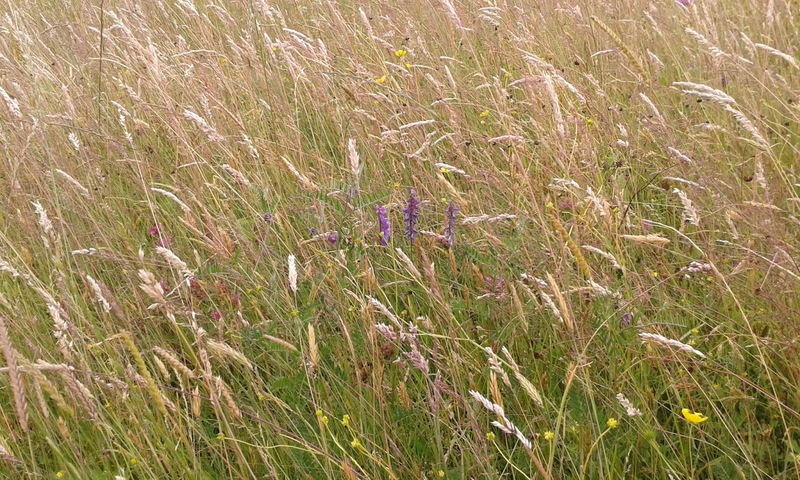 These fields have, perhaps, been farmed too much to become classic hay meadows, but the comparatively short period of chemical free management has encouraged the growth of more floriferous species, with the hoped for benefit for pollinators and farmland birds. Later this summer we will be adding strips of native wildflower seeds to add more diversity still. By doing this, I'm trying to prove to myself, and to other farmers, that it is possible to farm sensitively,meeting the needs of both the wider environment and the consuming public:the hay from these fields, and the autumn grass will be used by our Sussex Cattle. Walkers can cross the footpath leading back to Biddenden, and experience this attempt to mitigate past practice. ...and all I was, in ashes. Most days this winter I've gone down to our little ash platt, across a ditch from the body of the farm, checking on a feeder for the wild birds.Now, in late April, it is coming into its own, wood anemones,early bluebells and the occasional orchid. However, this sense of melancholy is caused by the worry of the Chalara virus that is poised to devastate our ash trees, and alter the biodiversity of woods like this. It is only about one acre, so I could conceivably replant with oak and maple, but in the meantime, light levels would change, brambles encroach, and the fence to fence sheet of bluebells, shortly to burst into indescribable flower, would vanish. An early bluebell, among the anemones. Ashes, bluebells and anemones. I coppiced this wood about 15-20 years ago, and ideally, the thinner stems should be taken out now, but I'm worried that the resultant new growth would be most at risk from the virus. The ground is still too wet to turn the cattle out, but perhaps another dry week.... For once, the nursery is fairly floriferous, and we are off to a fair at Godinton tomorrow. Rumour has it that people are actually thinking about going into their gardens! I found this rosette of Early Purple Orchids in a shave that I've been coppicing along the lane below the farmyard. I hadn't seen them there before,so I'll be keeping an eye on them in the weeks to come. The clash between the indescribable blue of bluebells, and the corporeal purple of the orchid is one of the sights of spring. We've had a few dry days now, thankfully, but the fields are still saturated and a long way off workable. We took the covers off the setting out beds yesterday,letting some welcome sunlight onto the overwintered nursery stock. On Sunday we hope to be taking some plants to Goodnestone Park, over in East Kent for the Hardy Plant Society's first event of the year, their snowdrop and hellebore extravaganza, not that we have any of these to sell! It's usually an encouraging day, buoyed up by keen gardeners eager to get outside after the long winter. Let's hope the wind isn't in the East. The past few days,after a very welcome blast of Swaledale, have been occupied in taking down the redundant coldframes, and starting to construct a raised bed to contain some of our stock plants that will get swamped as the shrubs in the borders get even larger.As it will lie alongside the path to the house, and, if we ever open the nursery,will be the first thing a visitor would see, we have decided to make a proper job of it, and build it using green oak sleepers rather than recycled boards.Unfortunately, these weigh a ton, and I have to use the forks on the tractor to move them into position:heavy rain and the action of the four wheel drive have created a fine sea of mud. Once I get all the sleepers in place we will fork over the ground, mixing in ballast for drainage.I then plan to import a peat free compost and topsoil mix to add to the farmyard manure that we already have in stock. having done all that, Elizabeth will be able to plant the subjects languishing in pots by the back door. The cattle are still out at grass, but the gateways are muddy, and I'll have to get them in.Before that,I will order a load of chalk for the yard floors, and spend a day replacing broken boards. We are a small Environmentally Conscious Farm and Nursery in Kent, you can find out more about Our Philosophy here and the Plant Fairs we are attending here. How fearful and dizzy 'tis to cast one's eyes so low! © Little Omenden Farm and Nursery. All rights reserved.